Rambling: Videos of the...Week? Month? This was an idea chucked around at the beginning of What About Cynics as a way to fill up a slot by posting other peoples content that we had found during our extensive time on the Internet. Now I found myself in a unique position where I have accumulated three Internet videos I want to (admittedly, very minimally) increase the exposure of, and give my two cents on. (Does that become two pence for the British?). Vague spoilers ahead. As I won't be naming all the cards, the only real spoilers here will be that the characters I name are still alive at this point (and sometimes when not necessary I will edit those out as well). Also, to appease those who don't want all the cards coming out at once, I will not be covering all of the cards in this article alone. I will be trying to keep it as spoiler-light as possible. 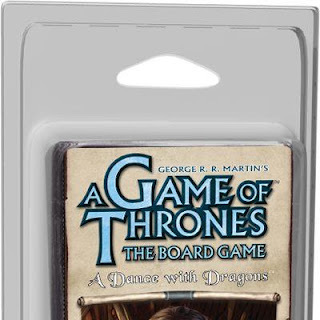 For more stuff on the core AGoT 2nd Edition Board Game, start here. If there is any great interest in this, I will be making another one. Oh man, even made the box art safe. Beautiful. But seriously, read those damn books. They are incredible. As of yet I have not been able to assemble a full game of A Dance with Dragons, I put the majority of the blame on university starting back up here in England, and so my players have started to go walk about, travelling to the four corners of this United Kingdom but there is little I can do about that. So I decide to set the board game up with the new cards and positions, and see what I could ascertain from just kind of looking at it and the cards. So here is my, as spoiler free as possible review of the cool elements of ADwD.